Marchers in this weekend's Unite the Right 2 white nationalist rally may have a harder time getting a ride or a room. Uber, Lyft and Airbnb are allowing drivers and hosts to deny service to potential customers who participate in the rally in Washington, D.C.
Each company issued statements this week that did not directly denounce Unite the Right marchers but made clear that providers can refuse service to anyone who makes them uncomfortable or violates guidelines against discrimination. Lyft said it had made clear to drivers in the D.C. area that "their safety comes first." "If they ever feel uncomfortable or disrespected by a passenger, they can cancel that ride," the ride-share company said in a statement to CBS News. Uber sent a note to drivers this week emphasizing community guidelines about "respect, accountability, and common courtesy." It said the company may remove people from the platform for violating those rules. "In general, regardless of event, drivers are advised to follow all local laws but have the right to refuse service to riders who are disrespectful or who make them feel unsafe," Uber said in a statement. Uber's announcement to drivers made no direct mention of Unite the Right and simply warned about "the active political climate in Washington, DC, and Virginia." 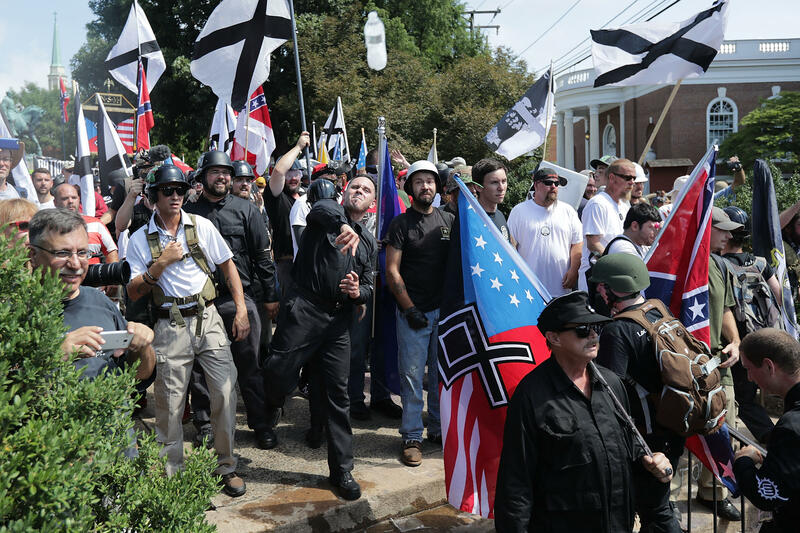 Airbnb, which banned some white nationalist users before last year's Unite the Right rally in Charlottesville, Virginia, said it's ready to do that a second time. "We acted in advance of last year's horrific event in Charlottesville and if we become aware of similar information we won't hesitate to do so again," the company said in a statement. The rally is scheduled to be held Sunday near the White House in Washington's Lafayette Park. The website for Unite the Right urges marchers to meet at a Virginia Metro station and ride public transportation into the city. The site also advises participants to take "an Uber or a taxi" to avoid police, press and protesters. It discourages marchers from staying with strangers or telling them about the march. "Don't let strangers know where you're staying. If you're going to be in town on Saturday, August 11th please stay with trusted friends and don't talk to strangers about your participation in the rally," the website says. Jason Kessler, the rally's organizer, did not immediately return a message from CBS News. Uber, Lyft and Airbnb each took some actions against white nationalists around the time of last year's march. According to BuzzFeed News, Uber permanently banned white supremacist James Allsup after an Uber driver in Washington kicked him out of her vehicle. Tim Gionet — an alt-right leader better known as Baked Alaska — was also banned for allegedly making racist remarks. Last year's Unite the Right rally ended with violent clashes between marchers and counter-protesters. One counter-protester, Heather Heyer, was killed when a rally-goer allegedly plowed his car into a crowd. The driver, James Alex Fields, has been indicted on federal hate-crime and state murder charges. Virginia Gov. Ralph Northam and the city of Charlottesville have declared a state of emergency for the anniversary of last year's rally. No rally has been scheduled for Charlottesville this year because the city refused to issue a permit.